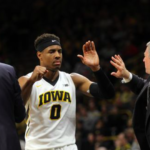 Iowa City IA- Things have not been going well for the Iowa Men’s Basketball Team lately, who were losers of there last four before coming into Monday night game against Stetson. But the Iowa Hawkeyes (4-5) turned up the defensive intensity to get a 95-68 win over the Stetson Hatters (4-6). The Hawkeyes are a very young team with only one returning starter from last year. But last night, two young players stepped up. Isaiah Moss and Cordell Pemsl led the way for Iowa with 21 points each. Down in the paint, Pemsl was getting whatever he wanted. Whether it was a 10 foot jumper or getting to rim, Pemsl was getting it done. But in the second half, Pemsl went up for a rebound and landed very awkwardly on his right leg. He was in pain, slamming his fist on the floor and didn’t look good for the true freshman who was helped off the floor and in to the locker room. Luckily the injury was not serious. Up next for the Iowa is #25 Iowa State. That game tips off from Carver on Thursday at 7:00 PM.